I have such good intentions of posting more regularly--but apparently it's going to take a while to develop the habit! This next project is one that was in the works for a verrrrry long time. In our house, we have a "butler's pantry"...that is, a walk-through hall from the kitchen to the dining room. 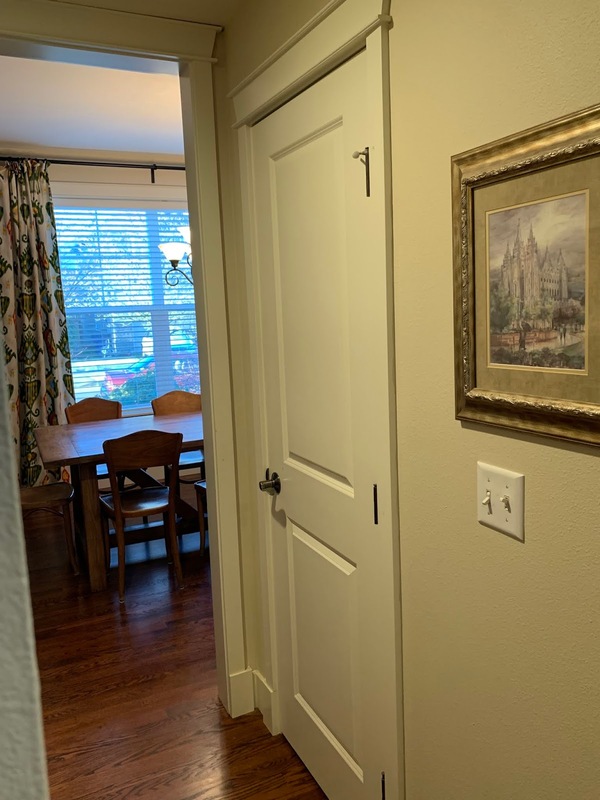 One one side, there is a short row of cupboards, and on the other side, there is a regular pantry closet. Years ago, I put up shelves above the cupboards and filled them with these glass jars from World Market (I was patient and got them for less than $10/each, with coupons). I *love* how they look! 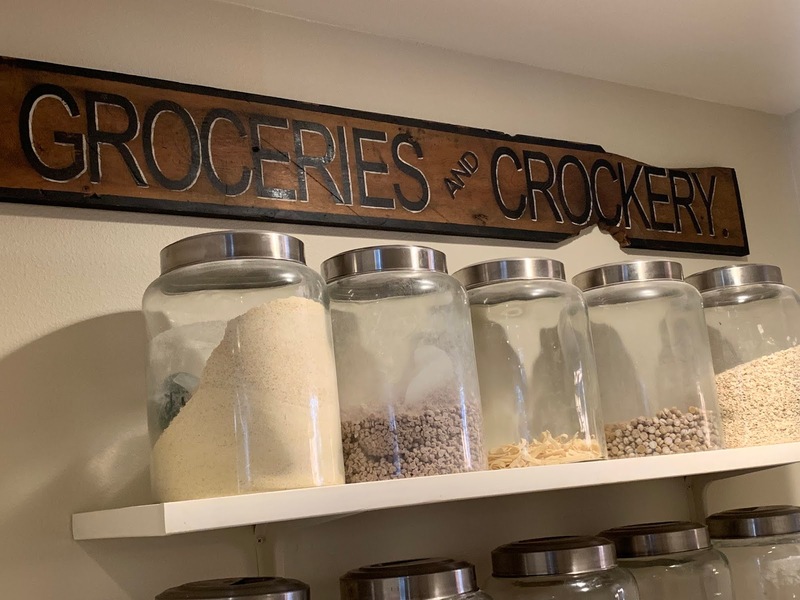 I also made the "Groceries and Crockery" sign above the jars from a piece of reclaimed wood. I do a lot of baking! It's one of my favorite things to do. 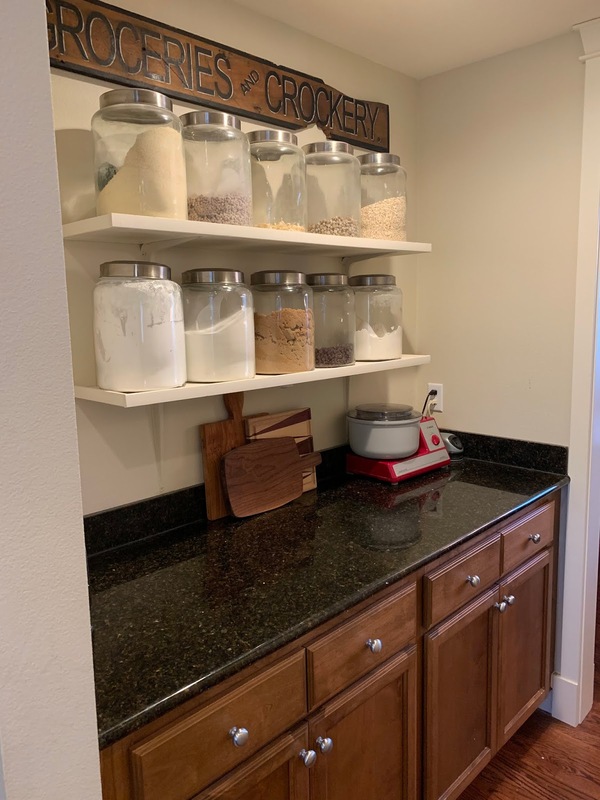 So the butler's pantry is my unofficial "baking center," since that's where I keep the mixer and my staples like flour, sugar, and chocolate chips! 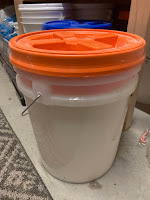 But when I say I do a LOT of baking, I'm not kidding...when all my kids are home, I make about 6 loaves of bread a week--that's at least 12 cups of flour, and my pretty glass canister only holds about that much. 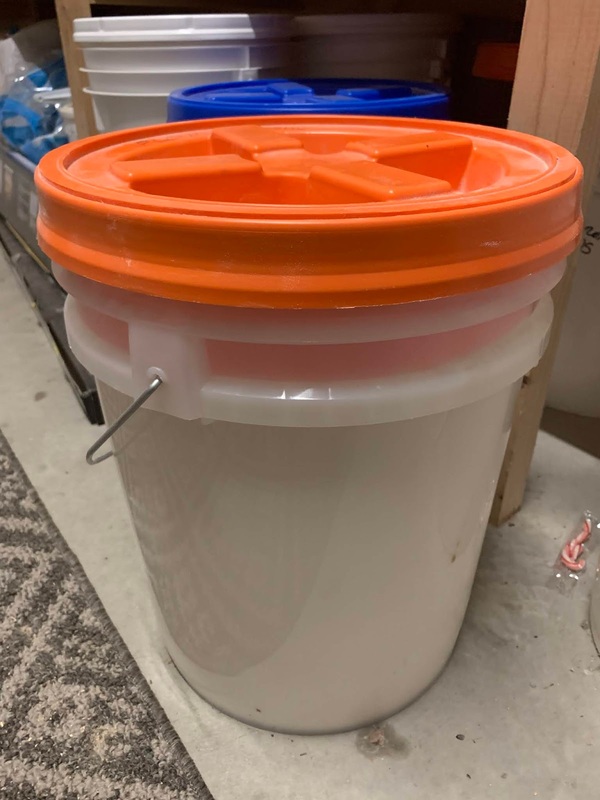 To save emptying and refilling my glass jars quite so often, I would generally just bring in one of these beasties from the garage. They hold 25 lbs of flour (or sugar, or whatever), and the wide opening was convenient to use. But they're not that pretty to look at. 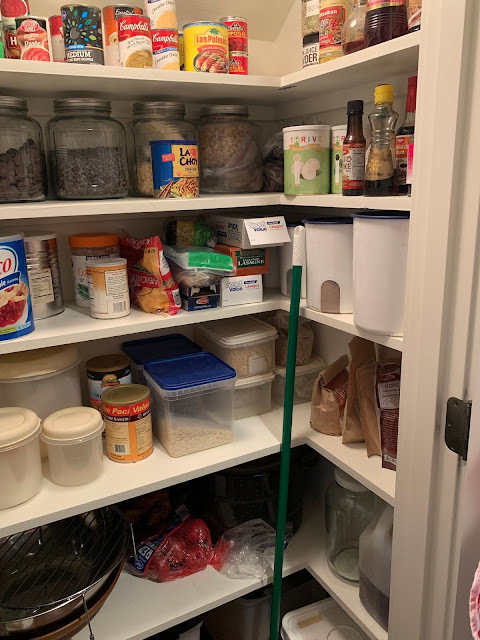 And in all honesty--often they just tended to live in the pantry for days on end, rather that moving in and out and in and out over and over again. So you can imagine that when I came across this style of bin, I was intrigued. Marketed for pet food, I could find no reason it wouldn't work just as well for food staples. They are food-grade and have a sealing lid to keep out bugs. 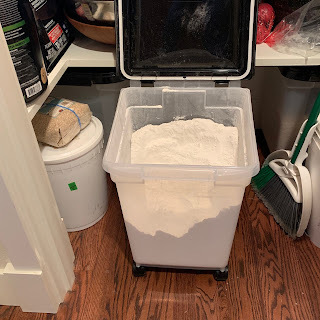 I thought how convenient it would be to just store these IN the pantry, and I could roll them out whenever I needed a lot of flour or sugar. There was just one problem: They didn't fit in my pantry. So this is the "before" of my pantry. It had four 22" deep Rubbermaid shelves. 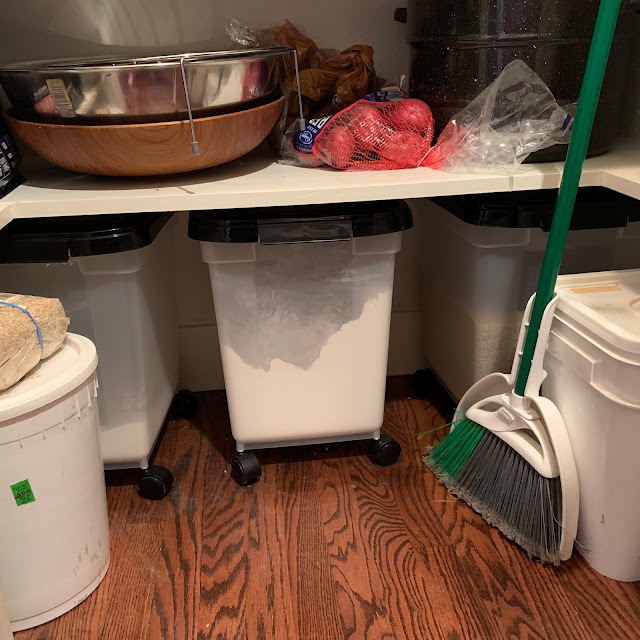 The bottom shelf, unfortunately, was not tall enough to put the wheeled container under, or the orange-lidded bins I had been using. 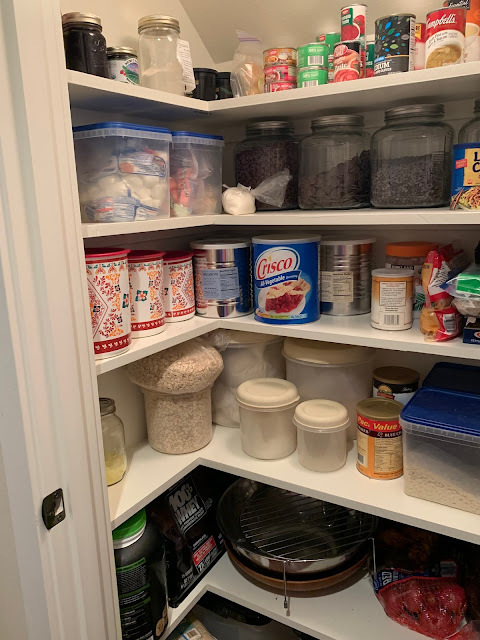 But since I wasn't crazy about the Rubbermaid shelves anyway, I figured it was high time for a pantry makeover! I was inspired by the pantry re-design of Lucy Designs. She ditched her wire shelving and built wrap-around shelving instead. I only had just over 7" of room on each side wall, but I carefully calculated out areas, and I determined that five narrower, wrap-around shelves would actually give me more surface area than my five deep Rubbermaid shelves, with the added bonus of being able to use the floor space the way I wanted to. All that said...it took me MONTHS to get started. I ordered three of the pet-food bins in January 2018. I finally re-did my pantry the week before Thanksgiving 2018. So for 11 months, the bins sat stacked in a corner of my dining room! First step was obviously to clear everything out. Taking out the Rubbermaid shelves is reasonably easy (usually). You can see how they are specially designed clips all along the back edge. A flat-head screwdriver helps to open those up, and then the shelf pretty much lifts free. 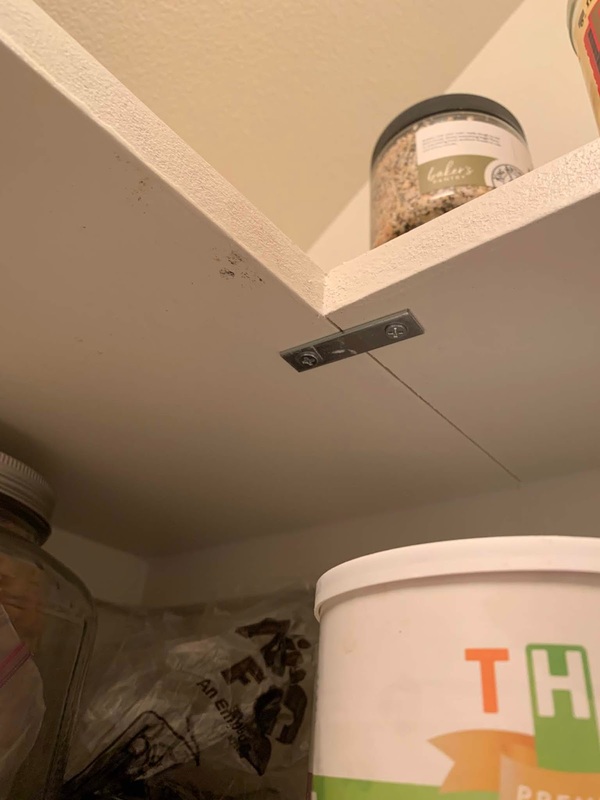 All of those clips are attached with drywall anchors, though, so a combination of a screwdriver and a pair of pliers are often needed to get those out. Next I put up rails for my five shelves. I marked all the studs and screwed them in where studs were. 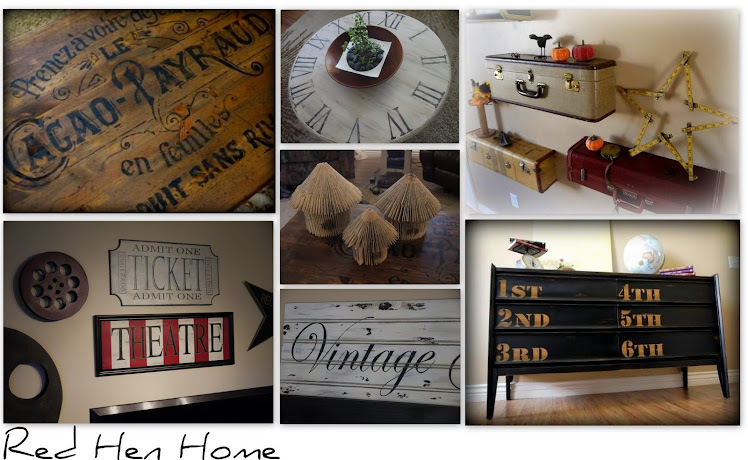 I started on the left and worked counterclockwise around the closet. For the rails I bought pre-primed 1x2 MDF boards. For the shelves I bought a single sheet of 3/4" thick MDF and cut it down to the sizes I needed. I don't have pictures of the next phase, but it involved a lot of cutting and fiddling and adjusting! The shelves along the back wall were cut the full width of the closet. This way they were supported on three sides, which makes sense since they will be the ones supporting the most weight. In my closet, the bottom two shelves are 16" deep and the top three are 12" deep. The side shelves are 7 " deep. They are supported on their back sides (the sides of the closet) and one end with rails, and then I used a mending brace to attach them to the wide back shelves. Those narrow side shelves also had to be notched out to fit around the door molding on the inside of the closet. If I hadn't done that, they would have had to have been even narrower than 7", I wasn't willing to do that. After that it was caulk...and caulk...and more caulk! Then paint...and paint...and more paint! I had primed my shelving boards before installing them, but in some ways it was just easier to finish up once they were installed. I ran out of space to dry boards in my garage, and it was cold enough that they didn't dry very fast anyway! I put just as much stuff on my narrower shelves, but it's SO much easier to see and find things! I love love love that. And my favorite part...bins of flour, sugar, and rice slide neatly under the bottom shelf! With holiday baking, I probably went through 75-100 lbs of flour...but with only a few trips to the garage, and my baking area stayed neat! And my best guess is that the pantry makeover came in right around $100, and that's including the few new containers I bought.